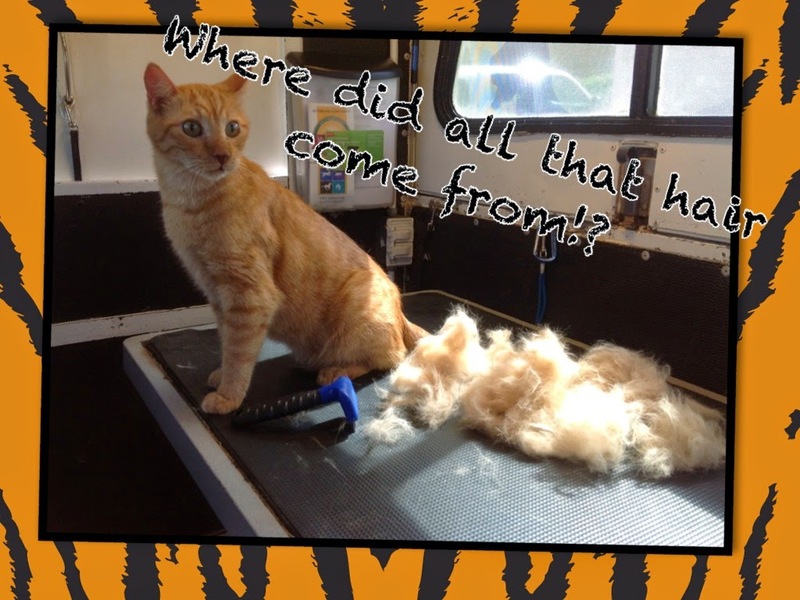 Did you know that we offer mobile cat grooming? And mobile dog grooming? You are right, most cats do groom themselves but that in and of itself can be a reason that they need a good shampooing. Consider that when a cat self-grooms they are licking and therefore ingesting all of the dirt, skin, hair, and whatever else that is on their body. Beyond decreasing the amount of hairballs your kitty gets, a good bath can decrease the amount of dirt and bacteria that are ingesting when they do self-groom and therefore lead to a heathier kitty overall. On the contrary, there are cats that have stopped the process of self-grooming. This can be for many reasons including arthritis, weight limitation, or other health concerns. 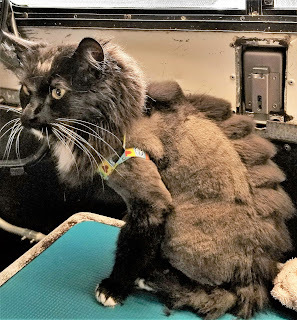 When a cat stops self-grooming it is always a great idea to take them into the vet to get a check up and make sure there isn't something more serious going on. However, some kitties just stop once they reach a point in life, and the grooming then gets turned over into our hands. 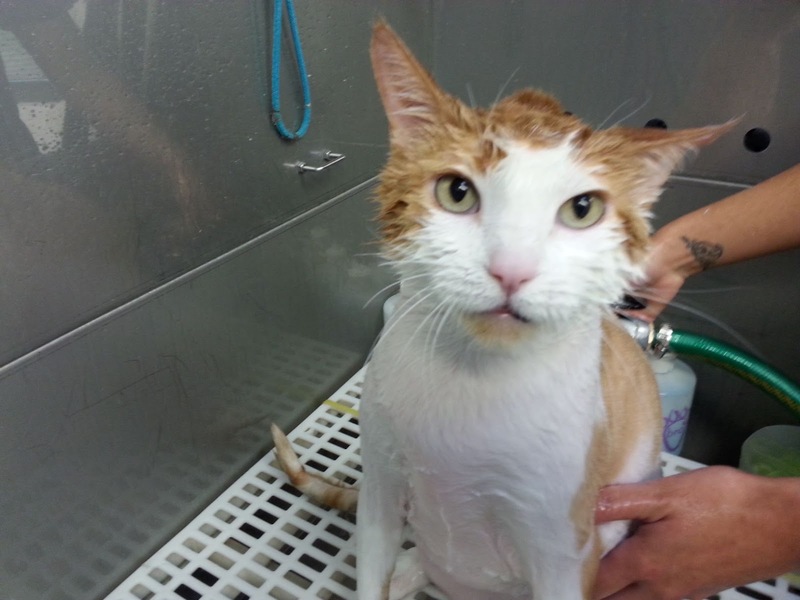 Another common question is, Don't cat's hate baths? If a cat is started off early in life with regular grooming, including soap and water baths, then they usually are very similar to dogs. They may not prefer it still, but they are very tolerable and it is not the end of the world for them by any means. 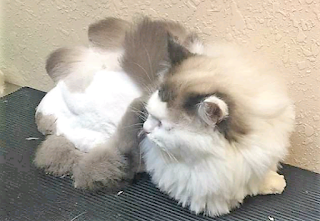 On the contrary, we see several cats who have not been groomed or even handled in general by someone besides their pet parent for the first few to several years of their lives. These kitties have reached a stage of life where they have stopped self-grooming. At this point we get called in to come and get their skin and coat back into good shape. The situation can get sticky from here because we cannot logically explain to Mr. Cuddles that what we are doing is for his benefit. All he knows is a stranger has taken him and is now putting water on him that he never asked for. His response is most often "get that water off of me and why don't you go ahead and get away from me while we are at it". As professionals we are trained and educated in how to start slow with kitties given their background. This entails keeping the grooming experience from being too overwhelming, working towards forming a trusting relationship with Mr. Cuddles, how to recognize the signs of Mr. Cuddles getting stressed, and where to go from there. The ultimate goal is to make it the best experience for Mr. Cuddles while taking care of his grooming needs. Our cat stylist are professionals and we expect them to use their knowledge and experience in all situations but especially when it comes to cats. Being a cat owner I am sure you know: cats rule the roost. Grooming can sometimes be a rather stressful situation for our cat family members. Our stylists are all trained to know what the signs of stress are and what actions to take to minimize the possibility for stress during grooming. 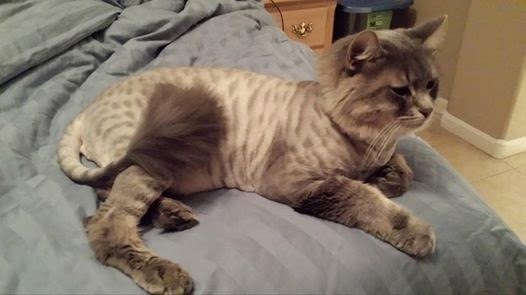 We as pet lovers and professionals always have the pet's safety and well being in mind first, thus if in the process of grooming your feline family member the stylist determines that his/her stress level is getting to high s/he will not continue. Of course that means you will only be charged for the services that have been completed, but more importantly you can rest assured that your fur baby is in the hands of an individual that has put your kitty's well being as top priority. In addition, when it comes to our kitty clients we always make sure to give you a phone call when we are on the way to your home. It is all to easy for those feline family members to disappear underneath a bed, behind the couch, or somewhere they cannot be found as soon as they hear the mobile unit drive up. Because of this we ask that when we do call you prepare by placing the cat in a specific room or in a cat carrier so that we can make the grooming process as smooth as possible. Often times if we drive up and time has to be spent getting Mr. Cuddles out from under the bed that has already set things off to a bad start as that in itself can stress out Mr. Cuddles unduly. There is a $30 trip charge for the stylist having come by to give it her best shot. Please note that we want what is best for your fur kids and should this be the case the stylist can give recommendations on what direction to take from here to get Mr. Cuddles groomed if necessary. 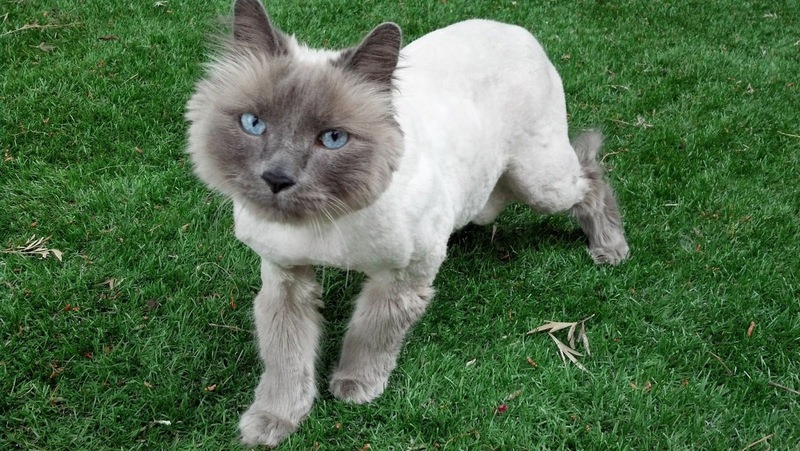 What grooming services do we offer for Cats? The grooming service for a cat automatically includes nail trimming and ear cleaning. The remainder of what we do depends on which service you decide on. What we offer for cats can include any of the following mixture (your choice): bath, brush out, blow dry, and/or hair cut. Please see below for prices based on what services you are looking for. 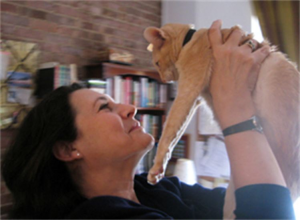 Furthermore, we would love to introduce you to Jane Ehrlich: Feline Behaviorist. She has spent time with our team enhancing our knowledge and we love her. IF your feline family members are exhibiting behaviors you don't understand or you simply want to understand them more, give Jane a ring. She has an amazing wealth of knowledge when it comes to cats and can really help you and your feline fur kid have a happier home. It's not always all about the dogs!! "There are no cat problems, just solutions waiting to be found! 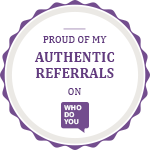 Professionally trained and over 27 years of experience. Based in Arizona but I help clients worldwide. Check out this short Video!! Check out this Video on Nail Trimming - Lots of great ideas you can try at home! Or you can check out even more reviews on Google and Kudzu. Arizona's Pet Stylist. Picture Window theme. Theme images by Mae Burke. Powered by Blogger.